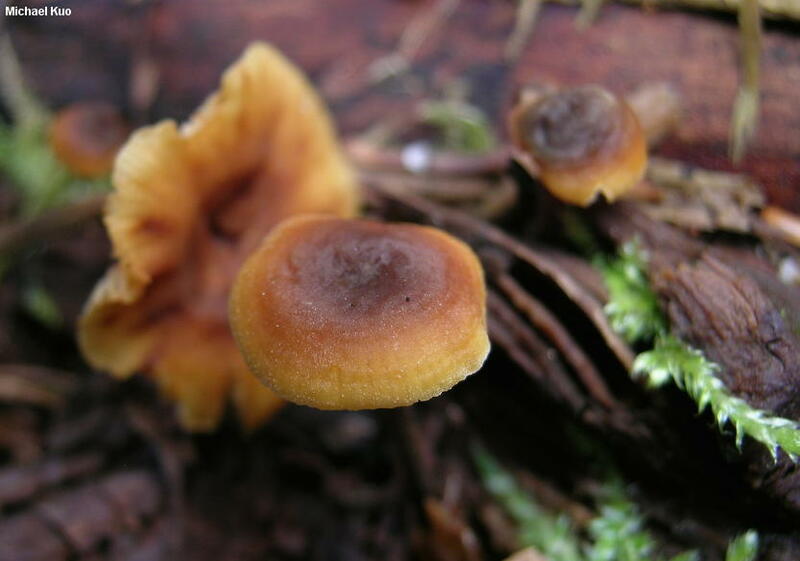 Xeromphalina cauticinalis grows in troops on the debris of conifers, primarily in western North America, although it is occasional in northeastern conifer forests. 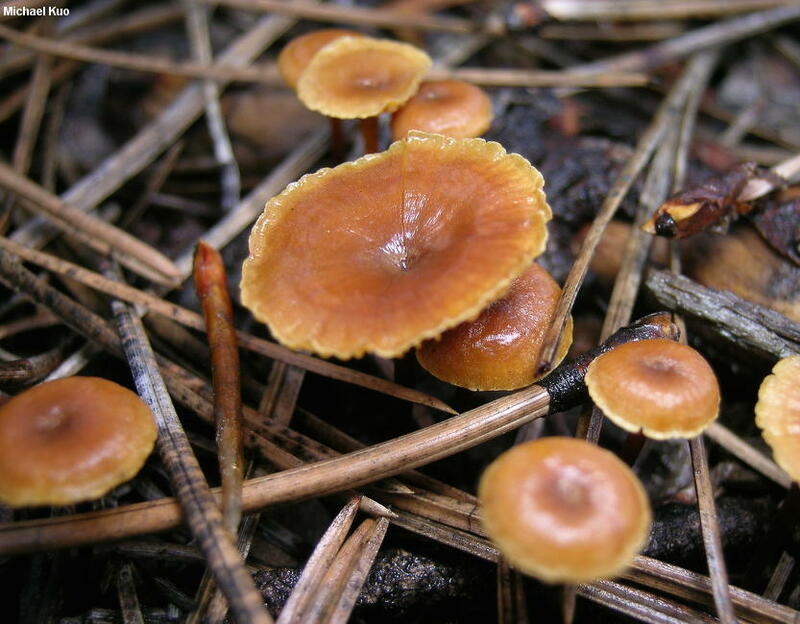 It has a small, orangish brown to yellowish brown cap, yellow gills that begin to run down the stem, and a tough little stem with a densely fuzzy, orangish base. 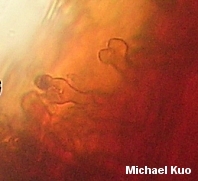 A drop of KOH on the cap surface produces a bright red reaction. Under the microscope its defining features include irregular and contorted caulocystidia, hyphae that are red in KOH, and ellipsoid spores that are at least faintly amyloid. 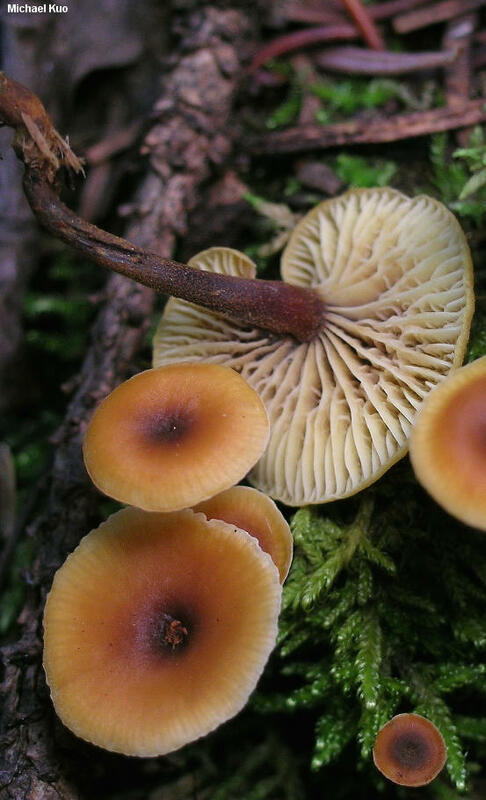 Xeromphalina cauticinalis var. acida is nearly identical but features slowly to instantly bitter flesh. 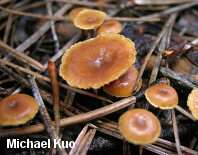 Ecology: Saprobic on the debris (including needle duff and well decayed wood) of conifers; growing gregariously in troops, or occasionally scattered or even alone, usually on the ground; summer and fall; widely distributed and common in western North America, and occasional in northeastern North America. The illustrated and described collections are from Colorado. Cap: 7–17 mm across; convex to broadly convex or flat, often with a shallow central depression; bald; tacky to dry; sometimes becoming widely lined on the margin; orange-brown to reddish brown or yellow-brown, often with a darker center. Gills: Broadly attached to the stem or just beginning to run down it; close or nearly distant; with many cross-veins; pale yellow; short-gills frequent. Stem: 1–3 cm long; 1–2 mm thick; more or less equal above a slightly swollen base; yellowish above, reddish brown to dark brown below; finely hairy or nearly bald above; base covered with orangish to rusty hairs. 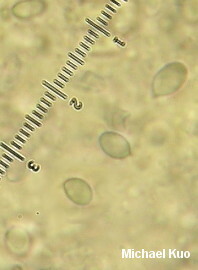 Microscopic Features: Spores 5–8 x 3–4 µm; ellipsoid; smooth; faintly to moderately amyloid, especially when just produced or when still attached to sterigmata. Pleuro- and cheilocystidia fusiform to narrowly clavate. Caulocystidia irregular and contorted; thin- or thick-walled. Clamp connections present. REFERENCES: (Withering) Kühner & Maire, 1934. (Miller, 1968; Smith, Smith & Weber, 1979; Arora, 1986; Evenson, 1997; Barron, 1999; Miller & Miller, 2006.) Herb. Kuo 08051002, 08071002.